The purpose of this course is to vicariously experience various lives expressed in history and culture through music, and theoretically gaze into human life hidden in art from diverse perspectives, including culture, history and ideology. You will comprehensively learn history, culture, and language skills by experiencing actual musical performances. 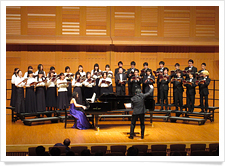 Two classes are held: one with a vocal ensemble (“historical music put into practice through choral singing”) and one with an orchestra (“historical musical put into practice through period-based performance”). You will actually participate in several concerts of historical musical works, thus engage your ears, sensory knowledge, and actual performance. You will thereby learn through research regarding the connections between the history, culture, and language transmitted through your activities. At the end of the term, you may showcase your results by participating in public concerts on campus or in the area. © 2019 Keio Research Center for Liberal Arts All Rights Reserved.